In places where wood or other biomass is the primary source of fuel, the smoke from cooking over open fires causes 4 million deaths a year. BioLite developed the HomeStove that powers its own internal fan to improve combustion and reduce smoke—with energy to spare to charge cell phones and other small devices. Roughly three billion people worldwide spend a disproportionate amount of their time and income seeking out electricity to power portable lights and mobile phones. 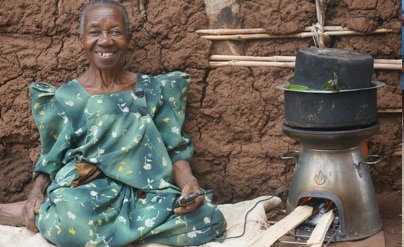 This "energy poverty" also forces them to cook over smoky open fires that create enough indoor air pollution to cause four million premature deaths each year—more than AIDS, tuberculosis, and malaria combined. This global problem was the impetus for the founding of the Global Alliance for Clean Cookstoves, a United Nations Foundation-led initiative dedicated to bringing cleaner, more efficient cooking technologies to 100 million people by 2020. 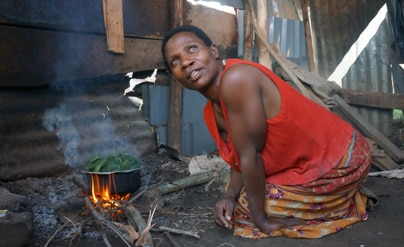 Fan-assisted cookstoves have existed before, however, they require external power sources to operate. BioLite solved this problem by creating a self-sustaining technology that can operate in off-grid communities anywhere. Users start a basic wood fire in the burn chamber. 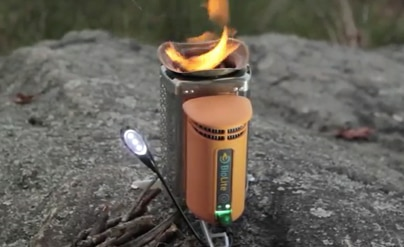 Heat from the fire is converted into usable electricity via a thermoelectric generator. This powers an internal fan that creates airflow back in the fire, dramatically improving combustion. Surplus energy generated is directed to a USB port where users can charge mobile phones or LED lights. Founders Jonathan Cedar and Alec Drummond were avid campers looking for a more sustainable way to burn wood in the outdoors. Their original prorotype, the BioLite CampStove won the top prize for lowest emissions at the 2009 ETHOS conference, a gathering focused on creating cleaner, safer, easier-to-use stoves for the developing world. They quickly realized their technology had potential for greater impact far beyond the trail and work on the HomeStove began. Today, the company has shipped to more than 70 countries worldwide. Why is the BioLite HomeStove revolutionary? The design of the BioLite HomeStove addresses both the challenge of traditional cookfires and a broader set of energy needs. 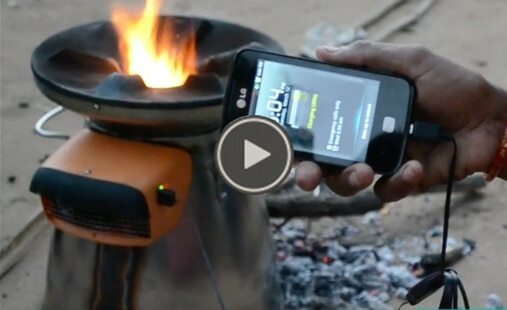 How does the BioLite HomeStove address the challenge of energy poverty? It's low-cost and high-performance, reducing emissions by 90 percent and cutting fuel consumption in half while generating off-grid power for users. BioLite is already bringing safer cooking and reliable electricity to villages — and campgrounds — around the world. BioLite is a dynamic social enterprise that develops, manufactures, and markets consumer energy products for off grid communities around the world. The company creates breakthrough cooking, charging, and lighting solutions for both outdoor enthusiasts as well as rural families living in energy poverty using a hybrid business model called Parallel Innovation: sales from the outdoor recreational market are re-invested into emerging market programs, helping to bring Energy Everywhere. It is the recipient of numerous awards including the St. Andrews Prize for the Environment, Popular Science Best of What’s New, Nokia Health Tech Awards, and Fast Company Innovation by Design Awards.